Enough of the cocktails. Back to cooking. My neighborhood farmer's market, New Morning Farm, reopened recently for the season (they take the spring off). As usual, they have lots of delicious seasonal fruits and vegetables. When I visit early Saturday morning, I'm never quite sure what I'll find, and my meals for the week begin to take shape as I'm examining their weekly offering. This time of year, they always have beets. The purple kind, of course, but sometimes other colors too. 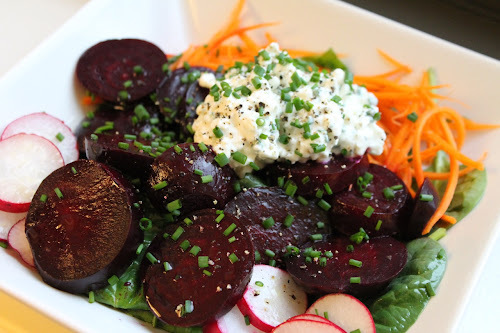 For this salad, I roasted the beets simply, sliced them, and paired them with raw, spinach, carrots and radishes. The dressing is pretty simple too: Olive oil, white wine vinegar, lemon juice and a touch of honey. The addition of the generous dollop of cottage cheese was inspired by Buck's Fishing and Camping, whose former chef, Vickie Reh, used to serve amazing homemade cottage cheese with a salad of beets and carrots. Her cottage cheese had large chewy curds and was mixed with cream, chives and black pepper. I didn't make this cottage cheese, but I did spring for something that's better quality than your typical watery supermarket variety, a cultured version at Whole Foods. It didn't quite match up to homemade, but it had more body and flavor than a store brand (if you're unwilling to spring for higher quality cottage cheese or make your own for this dish, I'd recommend just omitting the cottage cheese or substituting something else like chèvre. I think low-quality cottage cheese would not be good in this dish and would end up making a pink puddle). I recommend serving this with some crusty bread to mop up any remaining dressing and cottage cheese. 1. Preheat oven to 400 F. Wrap beets together in a sealed aluminum foil packet, place on a baking sheet and roast until the beets are tender when pierced with a fork, about 50-60 minutes. Set aside to cool, then peel with your hands (the skins should rub off pretty easily). 2. Portion out the spinach, carrots and radishes into large, shallow bowls. 3. Whisk together the olive oil, vinegar, lemon juice, honey, salt and pepper. Drizzle dressing over salads. 4. Add the cottage cheese to a small bowl, add about half the chives and a few good sprinkles of fresh-ground black pepper and stir to combine. Place a dollop of the cottage cheese mixture on each salad. Sprinkle each salad with the remaining chives. This was a great salad. I think you're wise to encourage your readers to spring for good quality cottage cheese. That's a smart tip.